Until the early 2000s it was highly unlikely that you would ever encounter a counterfeit $1000 bill that was good enough to fool you. Before that, most were produced in the Philippines over a twenty year period starting in the 1960s. There are hundreds and thousands of such copies floating around including poorly produced copies of $100,000 Gold Certificates, also made in the Philippines. These notes are also crudely produced and easy to spot. However, a new counterfeit $1000 bill from Malaysia is the most accurate we’ve seen to date. We first spotted the fake Malaysian $1000s while attending the Long Beach convention in the Winter of 2004. The fakes are surprisingly good and continue to fool coin dealers who buy these unknowingly at modest premiums over “face value”. But even paying $1100 or $1200 each for these “notes” is a significant financial loss as this paper has absolutely no value what so ever. The plate number at the lower right is not the correct shape. You can probably only notice this by comparing the note with the plate number on the genuine bill. The district number three (3) at the lower right does not have a completed loop as it should. To the untrained eye these notes can be very deceptive. One way to avoid ever buying a counterfeit note is to buy only third party authenticated and graded banknotes . (By PCGS-Currency and PMG.) 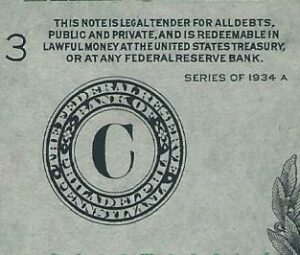 Otherwise, be cautious when considering “raw” Series 1934A Philly 1000s. Quite a few of these Malaysian fakes have already been confiscated by, or turned in to, the U.S. Secret Service (including 2 examples that we had). We plan on adding images of one of the known examples shortly.